"Has anyone seen an elephant?" And if no one has, then go deeper into the jungle." If you look very closely at the cover of this book, you will realize the fun you are going to have while sharing it. The intrepid explorer is on the lookout for an elephant. Keen eyes will note the tree and its branches are camouflaging the object of that adventurer's search. Instructions are clearly given by an unseen narrator. The child is looking for something worthy of time and attention. The narrator is willing to provide guidance and advice. Provisions collected, with binoculars in hand, the quest begins. With every turn of the page, another suggestion is made for best practice and assured success. Of course, those who are sharing this story can easily see the many hidden creatures while the explorer cannot. The fountain at the water hole, the surrounding white space at the house where no one answers harbor images of just what is being hunted. Every turn of the page is a new discovery. The child does not notice. A refreshing drink, shelter from the rain, and a vine swing all come thanks to the efforts of a hidden pachyderm - even, if you can imagine, a place of rest! Turns out the child is not the only one looking for something! 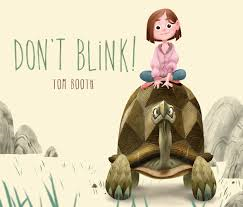 What a collaboration between two masters of storytelling this is for kids who love adventure, and books filled with delight. Go carefully as there is much to see for those who take the time to enjoy the game. Once read, a return trek will have young ones noticing even more the second time it is shared. "When Red returned, he could not believe what he saw. Their tree had moved! It was on its side, strapped to the back of a big truck. 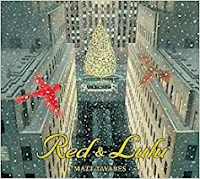 Red could hear the sweet sound of Lulu's song, coming from inside the tree. And then the truck drove away." Tonight is the night for the lighting of the Rockefeller Center Christmas Tree, and those who love the beauty of that event will tune in to the television coverage of the breathtaking and celebrated scene. It seems the perfect day to share Matt Tavares' new book. "Now every year, the head gardener at Rockefeller Center searches far and wide for the perfect Christmas tree. The chosen tree is almost always a Norway spruce, a type of tree that is not native to the United States. So it's usually found not in a forest but in someone's yard, where it was planted decades ago." In his book, he introduces readers to a pair of happy cardinals who make their home in the branches of the tree chosen to be that perfect tree. The birds love their home, spending the Christmas season listening to carolers sing about it - even occasionally joining them in song. It is a shock when it is cut down and taken away. Red is distraught at Lulu's departure and does his best to follow the truck and the tree to its destination. He just can't keep up. Still, he searches through the city, always on the lookout for his mate. Matt Tavares' rich watercolor and gouache images follow Red's search. The spreads are filled with the iconic New York City landscape, often from a bird's eye view. 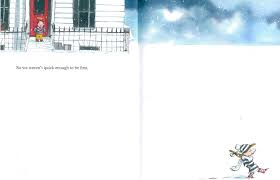 Wordless spreads are stunning, and provide all the story needed at different points. The brilliance of the colors chosen and the cheerful reunion will warm hearts, and certainly make this a book worthy of sharing as December closes in, and the holiday season bursts with annual splendor. I love both front and back stories - they are a perfect pair of bookends to the drama of the tree's removal, its new home and the birds' happy reunion. The panoramic views and changing perspectives warrant a close look and engaged attention. There is a lot to see here. You will want to read it more than one time. "Far out to sea, the waves have white tips. And deep down under the sea, my father is digging for coal. When I get home for lunch, it goes like this - my mother has a baloney sandwich on the table and a tall glass ... "
This is a book you will not soon forget! 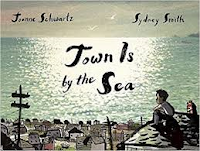 Set in Nova Scotia in the 1950s, it is the tale of a young boy who lives there. He introduces his seaside community, its inhabitants, and his father. is a miner working deep in the Cape Breton coal mines. The boy's day begins with the sounds and sights of his town. From his bed, he hears them and from the window he sees and smells the sea that is so much part of his existence. He and a friend head outdoors. He can always see the beauty of the sea; he is always aware that his father works far below it. After lunch he helps his mother by running errands. The walk home, beside that 'sparkling' sea, is wondrous. The contrast is evident and sharply felt for a young boy whose days are filled with freedom to explore and appreciate the beauty that surrounds him. I love the repetitive introduction to the various parts of his day: 'it goes like this'. His observations are perfect in helping readers understand life as it is lived in his town. He knows it is his father's life, and it will be his, as it once was his grandfather's. I think about the sea, and I think about my father. and the dark tunnels underground. One day, it will be my turn." The writing is sensitive and loving, while also realistic. Life is what it is in this mining town. Knowing how his father spends his days makes him appreciative of his own days. Sydney Smith's illustrations could not be more perfect. The scenes from the mine cover double page spreads where miners are barely seen under the black weight of their rocky ceiling. The beam from their helmets the only warmth shown. Contrast those to the expanses of sea, also shared over double pages: absolutely stunning on both fronts. The scenes from a seaside town are peaceful and picturesque, observing the quiet joy found in their family life, and the natural environment showcased in brilliant artwork. special: tickets to the ballet. This is a gorgeous wordless book that celebrates a popular and treasured ballet, The Nutcracker. The young girl, gifted tickets by her grandmother, is not keen to dress up in fancy, uncomfortable clothes and attend. It is a stormy night and going out is rather unappealing. The two are seated front row in the balcony beside a grandfather and his grandson, who annoys the girl with his exuberance for the upcoming performance. It isn't until the music soars that she is drawn into the wonder. Act One begins, capturing attention and concern over the fight between the Nutcracker prince and the Mouse King. The two young people make a brief connection during the intermission, and are then drawn back into the beauty of the second act. As the ballet continues on a happier and more splendid note, the reactions from both children and their pleased grandparents are endearing. They have made a connection through love of the performance. Elly Mackay uses brilliant color for the ballet scenes, alternating those with sepia tones and panels for the children and their reactions to the evening's performance. She also places spot illustrations on ballet panels to focus solely on the children and their responses. As they leave the theatre, the two continue to exhibit the joy felt while watching and share their own dance of joy on the way home. The front endpapers reflect the dreariness of the landscape prior to the performance, while the back endpapers show promise of a new friendship. What a grand introduction to an outstanding shared experience! "So they both tilted their heads. And noticed something. "That's where my wedding ring has been!" cried Lydia. "I haven't seen it in twenty years." "Y'know," said Mr. Grouse sweetly, "from this angle you look exactly like you did the day we first met." Did the cat arrive in town with a purpose in mind? If you know cats, you know that is unlikely. Independent and free-spirited, this cat arrives at an angle and calmly proceeds through town without connecting to any of the residents. But, the residents make a connection to the cat. They note his catawampus demeanor, and begin to look with a lean as well. As they do, magic happens. The grocer and his wife look at the cat from this new perspective only to discover a long-lost wedding ring. When Bob Long the barber, takes a sideways view of the cat passing, he snips a brand new long bob for a very pleased customer. 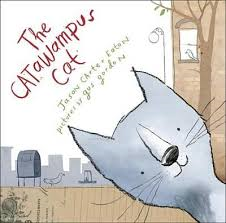 And so it goes - as the cat wanders jauntily through town, he changes lives and how they are lived. The townspeople begin to look at things with new perspective, and they are happier. she pulled the wrong book off the shelf. Gus Gordon does a fine job of interpreting Jason Carter Eaton's humorous word play with mixed media artwork that invites a long, leisurely look at the town, its people and the change in perspective their visitor brings. Following the nonchalant cat from one place to another, we note the town's energy, the inhabitants' diversity and interests, and the changes that can happen when life is slightly askew. And the cat? Why, his job was done! As parents of young children, you know what it is like to share a bed. There are times when it seems no one knows exactly where they belong when sleep overtakes. 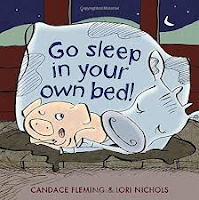 Familiar beds make for better rest as the animals in this agreeable story discover. The energy comes in the search for the perfect place to sleep ... your own bed! Pig is first to lodge a complaint. Arriving at his sty for a good night's rest, he finds an intruder. Cow quickly makes her presence known, while Pig settles in. Pig sends her packing. Cow is confused, but grumpily makes her way to her stall. There, she finds a noisy and disgruntled chicken. "Oh, fluff and feathers," clucked Hen. And she straggled to her coop, peckety-droop." This is a delightful story to share. Candace Fleming uses animal voices, expressive sound effects, perfectly-chosen verbs and wonderfully rhythmic, expressive language to appeal to her readers. It is a tale sure to be requested time and time again. I have personal proof of that, as I shared it often with Sicily when she was here last. The fact that it has a pattern will have little ones joining in in quick time. Lori Nichols' illustrations are comedic and show expressive annoyance as each animal is given the boot from one place to the next. Dark and dreamy in the surroundings she creates, kids will recognize each new mistake made by the animal sleeping in the wrong place. It's up to the dog to execute the final move and a perfect ending. AHHHH! Because I'm a bad seed. We are immediately warned. In this book, we are dealing with a bad seed and that's all there is to it! Everyone meeting up with this tempestuous narrator recognizes the truth, and is in agreement with the assessment. What makes the seed admit such things? 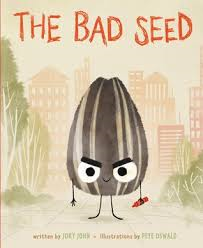 Tardiness, lying, a lack of attention to others, rude behaviors, uncleanliness ... you name it, it describes the 'bad' seed to a tee. Some conduct cannot even be said aloud, for fear of further judgment. Readers might find themselves and some of their behaviors mentioned here. It may even cause an uncomfortable chuckle. What has happened for a seed to make such a wrong turn? Life started out in a good family of many seeds; a family that spent time close together while ripening in a sunflower head. The trouble started with the release of the seeds from the flower itself. Their next home was a dark bag! You know what happens to a bag of sunflower seeds, don't you? The road to bad had been determined. 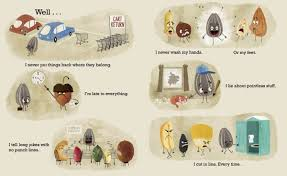 Pete Oswald used 'scanned watercolor textures and digital paint' to give life to this beleaguered kernel in emotion-filled, comical images. 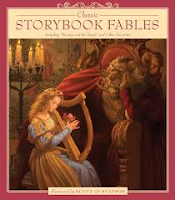 There is much to see in the surroundings, while the focus remains firmly on the narrator throughout his tough tale. These are behaviors familiar to many of the children who will read the book. Will they see the benefits that come from a change in attitude? They are sure to have experiences of their own to share at home and in the classroom. Perhaps it will give all who share it pause to think on the way they spend their time. "Mr. Evans showed me how to catch the birds and slip them into a basket. Then, we'd wheel the basket to the station in a barrow. "How far today, then, Mr. Evans?" the stationmaster would ask. My friend would name a station up the line:"
Moving can be a very trying experience for everyone involved. The young boy who has just moved from Rome to Britain feels homesick every day. Nothing is familiar, and he assumes the stance of an outsider. Only one thing brings comfort and a reminder of home. Mr. Evans is a neighbor; he has racing pigeons that look like the ones in Rome. Mr. Evans may be old and a bit unsteady, but he loves those birds. His life in the mines brings a rich appreciation for their freedom and beauty. He is a willing teacher to a young boy in need of a friend, and some distraction. As he learns about the birds and watches Mr. Evans training them to fly to various stations up the train line, the boy is patient and engrossed. Once the birds are released, the two go to Mr. Evans' home to wait. They always come back. The pigeons are an impressive lot. As his new friend's health declines, the boy plays a larger role in the training of the birds. "By racing season he couldn't leave his bed. and took them to the station. I scoured the sky for their return and checked them in." Mr. Evans has big plans for the bird with 'the milk-white head': the bird he has given to his young and eager friend. Can the bird make the long journey back from Rome? Is it possible? Might Rome prove irresistible with its sunlight, its fountains and its alluring ice cream aromas? 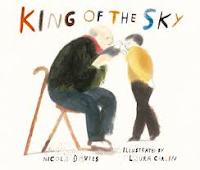 Loneliness, home and friendship are at the heart of this emotional book by the exceptional Nicola Davies. 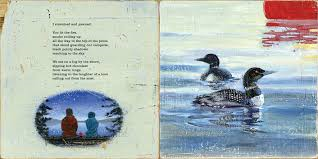 Laura Carlin's mixed media artwork is as quiet and telling as the story itself, while allowing readers to see the local surroundings and the boy's family life, as well of the beauty of the birds themselves. I love this wordless book! 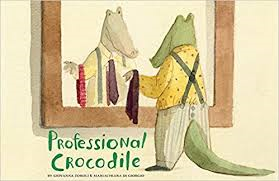 As a reader and watcher, we are alongside Crocodile as he wakens to a new day, and prepares himself for what is to come. Once dressed and breakfasted, he makes his way from home to work. It is quite the engaging and impressive journey. There are stops along the way, and a subway ride that is quite trying. Finally arriving at his stop, he climbs the steps to the city street, pauses to make a few purchases and continues on. Street sounds, smells, and connections are carefully considered as he makes his way along the busy street, through a courtyard, then a gate and along a park path. Young ones and those who share this wonderful book with them will be delighted with its surprise ending. I guarantee it! Nothing prepares you for it. He is quite the professional. The details will keep readers talking and watching and responding to the many scenes as they unfold along the way. While mostly surrounded by people, he also experiences many little surprises, humorous bits, and familiar surroundings. If you are VERY observant you will note characters who appear more than once, and many other details meant to delight and entertain. Once shared, young ones will want to take it in hand and tell their own story. Sure to be on your reread list! You will enjoy it every time it is shared, and find something new. It boggles my mind to think how fast my granddaughters are growing! As their parents deal with the daily wonders of time spent together, they don't necessarily notice the many changes I see with each FaceTime visit. I know it is what happened to us when our kids were small, too. in the blink of an eye." Isn't that the truth? It is such fun to watch these children with their innocent, charming faces do what little ones do. They eat, sleep, smile, laugh, chew on their own toes, and cry! We are there to soothe, feed, swaddle, rock, entertain, and love them. All of that is evident in the gentle family images AG Ford has created for the various scenarios. He was inspired to create the scenes based on his fascination with his own baby Maddox. This book is filled with impeccable language; its rhythms carry the reader from page to page sharing a fascination for all things 'little'. These moments will be recognized by everyone who has watched with delight, and even a slight feeling of dread, as days pass and children grow and change in every way. Do you know someone expecting a new baby? If you do, what better way to celebrate the birth than making a start on a library? 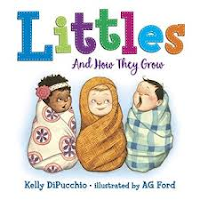 Add Everywhere Babies (Meyers, 2004), Ten Little Fingers and Ten Little Toes (Fox, 2010), Welcome Baby (Reid, 2013), and Hug) (Alborough, 2001) to the stash and that baby and its parents are set to begin the reading journey of a lifetime. stays hopeful and brave, knowing that we're on our way!" "Hey, Sadie, wait! Who's Ellsworth?" "Sherman, you have to keep up. Every fish deserves a proper name." I have an abiding admiration for the creative work Philip C. Stead and Matthew Cordell bring to the children's book community. Their stories are much loved by many, including myself. 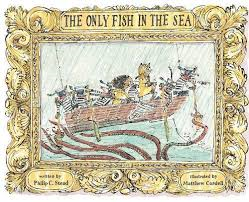 I have posted 9 books from Philip and 18 illustrated by Matthew. I want to introduce you to their newest adventure today. Amy Scott no longer sees a goldfish as worthy of being her pet. Thus, her birthday fish, still swimming in its pet store plastic baggie, is tossed into the sea. What? How could an albeit spoiled and sardonic young girl be so inhuman and unfeeling? This scene is played out in the prologue, and readies us for this new tall tale. Sherman shares the disturbing news; Sadie is agitated. She lets Sherman know the perils of the sea for that poor abandoned fish. She only hopes it will know that help is on its way. They will need equipment to assure the rescue. and appropriate headwear in case of weather - good or bad." One can only imagine how each item will aid in the recovery. Six nattily dressed monkeys will be their companions in adventure. Sadie has no concern. Sherman's expressive response to her assurances show significant uncertainty. Never minding those same dangers that might harm the poor fish, off they go! Once rescued the villagers rally round, providing friendly comfort and care for the recovered fish. Amy Scott? She gets what she deserves, I guess. The dialogue is entertaining and appealing. Matthew Cordell's signature pen and ink with watercolor illustrations will have little ones poring over every page as they enjoy the silly antics of the monkeys, the sea rescue and the triumphant return of the intrepid partners ... with Sherman! Welcome back, Sadie! What? This is your first meeting? Get yourself to the library, or book store, and see if you can find Special Delivery (2015). four geese can be difficult. 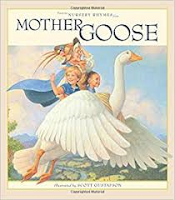 nearby to explore ... "
I hope you remember Bruce and his adventures as the reluctant father of four geese, after he mistakenly adopted them in Mother Bruce (2015). His life has not been easy since then, although he has come to love them and give them the care they need. All grown up, they have no intention of leaving Bruce and the comfort of home. The mice who managed to take over his house in Hotel Bruce (2016) are another matter altogether. They, too, are grown and enjoying the amenities of a ready bed (right on top of Bruce along with their geese counterparts), sharing the bathtub, and his living space while making as big a mess as can be imagined. Bruce wants them out! His attempts to have the mice move are unsuccessful ...no matter what he tries. So, Bruce decides that he will be the one to move, and he will take his geese family with him. Finding the perfect house is fraught with problems. Bruce perseveres. Finally, he finds the perfect place, settles in and rejoices in the dearth of mice. The geese feel decidedly different about their circumstance. What's a father to do? Fans love the grumpy bear and the difficulties he faces! They also love the geese who reveal their thoughts through action and expression, while never saying a word. The talkative, exuberant mice are without filters, humorous and as annoying as they can be. All that is not said is shown in the delightful 'scans of treated clayboard for textures, graphite, ink and Photoshop' images that fill the book's pages. Hilarious and highly anticipated! There will be giggles galore as you share it. I love the pristine look of new-fallen snow ... before anyone (or any hare) manages to make tracks and change the beauty of it. We have so many hares in our neighborhood now that it is rare to actually see new-fallen snow without tracks at anytime. I miss the chance to be the first one to step into it. So, I totally understand the little boy's angst over his grandfather's complete lack of understanding for the need to rush and be first to walk in it. Every peek out the door has him noticing the others who are out and making their marks in the shimmery snow. Granddad is still abed when his grandson is bursting with the need to get out there. As he lays aside his book, heads for the shower, and slowly dons the proper attire for being outside, his grandson offers a running commentary on what is happening. The boy is unconvinced, until he discovers his grandfather is spot-on! I love all the white space, and the way it changes as more and more traffic is observed passing by. The ink-and-watercolor illustrations are perfect for children who will be charmed by this relationship between a child and his beloved grandparent. The chaotic fun at the park even entices Granddad to have a go at flinging snowballs and enjoying the gamboling. After reading and sharing Rain, now Snow, I am highly anticipating the release of Sun in 2018.
and had a hole in it. will be for the winner,"
Tigey is hyped that race day has finally arrived, and he is geared up to win ... and win big! Mama Lion wants him to know that a win is not the be-all and end-all. We know that she has an ulterior motive for him being happy should he not come in first. At the start, they are ahead and the young cub couldn't be more excited. When misfortune rears its ugly head, the car loses one of its wheels. The Flying Pandinis stop to offer aid. While repairs are being done, the wily Bun Bun is able to pass them all and take the lead. 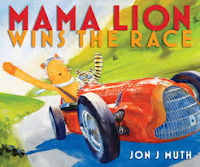 Once they are back in the race and nearing the finish line, Tigey and Mama Lion are faced with a difficult choice to make. How badly do they want to win? There is a subtle lesson here, as can also be found in Jon J Muth's Zen books. Kids won't be aware they have learned it, as it does not, in any way, feel meant to teach. The toy characters are filled with a zest for the task at hand, and with a winning warmth. Kids will like them immediately. Mama Lion is in charge from the get-go, knowing that she wants what is best for all involved. Little ones will love the joy in the race, and the chance to be a winner. In the end, isn't kindness what it is all about? And, wasn't that adventure a great deal of fun for all? “Here is our chance to do something really amazing." Please do take the time for a long and leisurely look at the lively gouache, pencil and ink, and watercolor images. They are filled with the full action of the race, cameo appearances by a few beloved characters from a child's favorite stories, strong colors, lush backgrounds, and oft-changing perspectives. "In the afternoons, his father would often go out with his older brother to gather walnuts and almonds, while his mother would nap with his younger brother. That's when he would read himself a story. A middle-sized story, like this one." Poor middle children! They are too young to do what their older sibling can do, and too old to do what their younger sibling is allowed. They can't stay up as late as the older one, and can't go to bed as early as the little one. They are not big, nor small ... you will know all of this if you are that middle child. A quest to find the willow bark his parents need to cure their colds leads the brothers to the riverbank. The river is only partially frozen; it is too dangerous for both the older and the younger brother to try to cross. Not so for the middle one. He is the right weight, has the right stride, and is successful in accomplishing the task given. Off he goes to get the willow bark. Only when the task is completed does he realize that middle might be OK at times. made his way back down the mountain." The text is bland and repetitive, in keeping with the middle bear's sense of ennui concerning his place in the family dynamic. 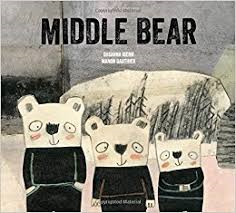 It is perfectly written for describing how Middle Bear sees his circumstance. With the use of repetition to describe him as middle (spell mediocre), readers are painfully aware of how his life is affected. 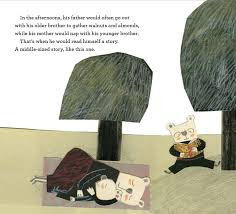 Using collage, muted colors in black, grey and tan, and unsophisticated images that make each brother look exactly the same but for their size, Ms. Gauthier creates artwork that perfectly emphasizes the plight of the middle bear. Middle children, rejoice! You do have your own special place in the world. Snappsy is back; so is his chicken friend. Neither personality has changed much since the last time we met. Snappsy continues to be reticent about being made the center of attention. 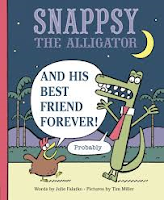 The chicken continues its constant over-stating of Snappy's attributes, and persistently focuses on their many adventures together. Inherently false, Snappsy is embarrassed by the chicken's presence and adoration. The chicken insists that being the alligator's BFF is paramount and evident. Snappsy finally succumbs to anger, resulting in Bert's departure. Will Snappsy miss Bert's constant conversation and ebullient spirit? Of course he will. The humor will have kids and adults chuckling as they share this second tale of enthusiasm and avoidance. The illustrations 'made with brush and ink and computer hocus-pocus' add appeal and context. The two are so different; the speech bubbles and comical art assure understanding of each distinct personality as they go about their days. Mayhem is at the heart of the tale, right up until the final spread. doing the things that best friends do.
" A STORM IS COMING! There's no time for panic. At last, everything is ready ... "
A STORM IS COMING! no longer frightens me at all. That is what happens with retirement - on most days. Of course, I will have to deal with its aftermath; when it arrives, I call SNOW DAY and stay put. When the forest animals hear the news of an impending storm from worried birds, there is no panic. Instead, they all get at it. They gather wood, food and other necessities that will help them weather any inconvenience it might bring. As the wind picks up and the storm rages, the fox family enjoys the warmth of their den and the meal prepared for them. Little Fox has a worry. "What if others are still outside?" A turn of the page shows two indistinct figures emerging from the windswept landscape. The animal families are aware of their presence and have questions. When they hear a knock on their doors, they are quick to refuse entrance and hustle them off to the next home. Each family has a lie to tell concerning the help they can give the two bears. "We have no food. Try next door." Readers see the giant pile of acorns stored in the squirrel's tree. Poor bears! The story is the same at every turn ... no one is willing to help. Don't forget Little Fox. His kindness shines through. The brothers determine to make the most of a nearby hill, knowing they will be fine as the snow falls around them. They have their tea to keep them warm. Will they repay the kindness shown when the Fox family finds itself in peril? At a time when we are in need of kind gestures and warmth, this gentle story is perfect for reading aloud with our children. 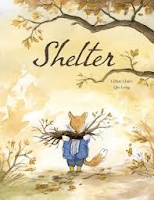 The watercolor and ink artwork adds compassion and depth to this tale of finding refuge when it is needed. November has been a bit of a weird start to winter for us: lots of snow, and freezing temperatures have made it feel a bit January. It has certainly got people in the mood for Christmas buying, and thinking about the gifts they will give. 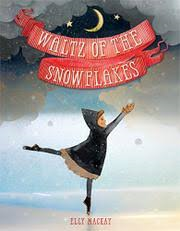 It reminds me that I have a bunch of books about snow and winter I want to share. I will begin with Richard Jackson. This long time editor of books for children has recently turned to writing for them as well. 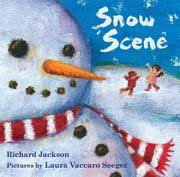 In this newest book, he uses spare text as a invitation to little ones to find joy in the snowy scenes that unfold. As he teaches his readers about snow and its many wonders, Ms. Seeger uses stunning acrylic artwork to help them follow the verbal clues on full page spreads. One spread meaningfully connects to the next through a series of questions and visual clues. With each page turn, readers' attention is drawn to a more detailed panorama. The gorgeous scenes move from day to night and from winter to spring, offering an invitation to get outside and enjoy all that nature has to offer. Be sure to check for Mr. Jackson's other books: Have a Look, Says Book (2016), In Plain Sight (2016), All Ears, All Eyes (2017), This Beautiful Day (2017). "At lunchtime, Beauty found a lavish meal laid out for her in the dining room. Even though she was alone, she enjoyed a lovely concert played by invisible musicians. That evening at dinner, her host finally made an appearance. 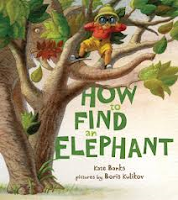 As she was about to seat herself at the table, Beauty was startled to see the Beast standing in the shadows ... "
Two enchanting new picture books for today's post, in celebration of Picture Book Month! I have long loved Scott Gustafson's books and art. They are perpetual favorites for bedtime reading at my house. There are eight tales here. As he has done in previous works, Mr. Gustafson uses his formidable talent for elegance and detail in creating the artwork for these familiar stories. Expressive and emotional, they invite careful observation and are sure to result in discussions that will enhance the tales told. Backgrounds change, as does image placement in the way various spreads are designed. From the sly look in the crow's eye when solving the problem of unquenchable thirst, to a smug pug emperor who is bamboozled by duplicitous foxes, to the lazy farmyard animals who will have no part in helping The Little Red Hen until they hope to reap the rewards of her labor, there is something here for everyone. I was not familiar with The Boy Who Went to the North Wind. Who knew the wind that plagues many of our days in winter could be such a friend and provider? Lessons taught and learned, memorable characters to be admired or not, this is a book that will be enjoyed time and again. I have always loved nursery rhymes. As a child, they were definitely my first poetry. We shared them in the car, on walks and in the bathtub when our kids were little. It makes me sad to think so few kids know them today. They have such an effect on language and future success in reading ... kids need the ability to rhyme to help them when they are learning to read. It's been eight years, 3500 books and more than 750,000 visits since I started on this journey to share the books I love with you! It has been a wonderful experience, and I am proud to say that I have missed only a few days along the way. When I look back and see that in the first month I posted more than 80 books, I can't believe it! Now, I do my best to get one book a day done; occasionally it might be a few more. It is a labor of love for books, for readers, and for those who find something worthwhile here. Thank you for your support, your comments, and for continuing to visit. I will do my best to keep sharing books with you! "Missing in action. Lance groaned. His sorrow was for the family he'd leave behind. And for Coal Dust. Such a noble animal had not deserved to die. Then he wondered. What if ... No. He told himself he shouldn't fool himself with hope. Even if Coal Dust had survived, the shell would have sent him running in panic. He would have stayed with the herd and galloped away with any surviving cavalry. Yet ... "
Three fictional soldiers, eight animals braving terrible and terrifying conditions, and brief sections of informational text to add understanding for the stories shared will find favor with eager middle school readers who are keen to know more than they already do about the Great War - WWI. The French battlefield at Vimy Ridge is the setting for the eight accounts shared. A different animal is showcased in each one. They were used in battle to get messages from one place to another, to carry ammunition and supplies, to carry soldiers into battles and hopefully be there to bring them out. Nonfiction sections follow the story to help explain how each participated and their importance to the fighting. "When Cher Ami was released, enemy gunners were waiting and fired such a volley that three bullets struck the bird. One bullet blinded Cher Ami. A second bullet tore through his chest. And a third bullet shattered his leg. Cher Ami fluttered to the ground. Then, to the soldiers' disbelief and joy, Cher Ami struggled back into the air and flew forty kilometers (25 mi.) to deliver the message, saving the trapped soldiers." Further explanations discuss the use of the carrier pigeon in war, communication difficulties in World War One, and enhance understanding for how carrier pigeons deliver messages. 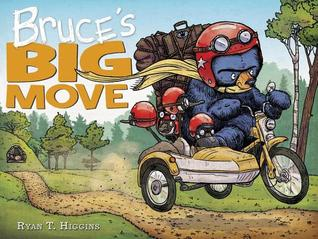 Kids love to know these stories of heroes in the animal world. They have such admiration for the work they do, as did the soldiers they helped. Jake, Charlie and Thomas are three soldiers from very different backgrounds and we learn about them as we read. Included in the text is a discussion concerning the treatment levelled at indigenous soldiers while they were fighting and following their discharge, offering a chance for readers to learn more about aboriginal history. 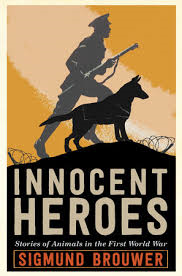 Action-filled and detailed, this book brings bravery to the forefront - brave soldiers and brave animals. I like the short sections that follow each account as they provide information that make the stories even more memorable. They could be read aloud chapter by chapter in middle grade classrooms to give listeners a sense of the sacrifices made by so many. 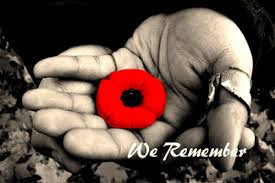 Today, we need to honor those who fought, and who still fight, to assure our freedom. "The sinking of ships - especially non-fighting ships - without any warning was new too. In the early years of the war, Germany limited which ships its U-boats attacked. But in early 1917, it saw a chance to win the war by starving Britain, its strongest opponent. Britain tried different ways to stop the submarine attacks." 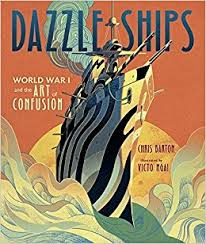 I had never heard about dazzle ships. So, I found this book to be both fascinating and beautiful, as you can see from the accompanying artwork. Submarine attacks by German U-boats were increasing during World War I. Never before had ships been attacked so relentlessly. When Germany saw a chance to starve Britain by sinking supply ships, the British knew something had to be done. Many suggestions were made and discarded. "And a Royal Naval Volunteer Reserve lieutenant-commander named Norman Wilkinson had another suggestion. It was unlikely. It was improbable. It may have even seemed bonkers. His idea was to camouflage the ships." Fooling the enemy was what they were looking to do. Others had suggested camouflage. Perhaps its time had come. Desperate, the government agreed. Hoping to cause confusion for the enemy, the ships were painted. Could it work? Artist Victo Ngai uses mixed media to create beautifully designed pages to explore color and 'dazzle' in full page spreads. They are striking and worthy of attention. More than 4,000 ships were painted; in the end, there was no real proof that they had done what they were meant to do. This nonfiction book does provide a engaging look at an unusual and relatively unknown side of the war effort. "Times change. Technology changes. Torpedoes get faster, submarine targeting systems get computerized, challenges of all kinds get replaced by new ones. But a willingness to tackle problems by trying the unlikely, the improbable, the seemingly bonkers will always be needed." Notes from both author and illustrator are included in back matter, as well as a timeline with archival photos, and a list for further reading. calling out from the mist. What a lovely memory of a season just ended! Time at the lake is, for many, the ultimate getaway. Sharing this book will remind readers of the joys to be found in the natural world, and of an early morning spent on the lake fishing. There are wonders there: loons, a moose, a beaver, a squirrel, an eagle. This early morning paddle and leisurely wait for a fish to bite allows exploration of each memorable sight and sound. Jean Pendziwol describes each tiny moment in poetry that will resonate with all readers. This book is a feast for the senses, meant to be quietly inspiring and am homage to the awesome beauty of its setting. survived the wind and rain." The many remarkable moments are captured with acrylic paint on panel boards. The full page spreads feature eloquent text facing textured, detailed images of the quiet Canadian lake environment. The red canoe captures attention and keeps all readers focused on its journey. 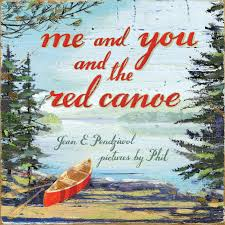 Though we never see the faces of the two canoeists, we share their powerful connection to and their wonder at the morning's beauty. the sunlight sparkling in our wake." 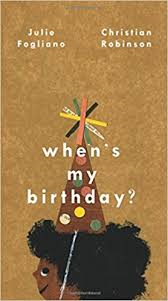 "will my birthday be in spring? will my birthday have some singing? will we sing so happy happy? will we dance around and round? will we jump and jump and jump? 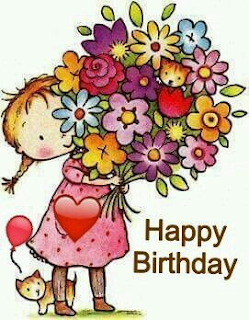 I have said it in previous posts - besides Christmas, the most important day for little ones is their birthday! Such a celebration it is for everyone. When Sicily recently celebrated hers, I asked how it felt to be THREE! She was quick to point out that, in fact, she was not THREE, she was three and a half. Yesterday she was two and a half. Today, older than that. Perfectly logical! So full of rhythm and absolutely in tune with a child's feelings as that special day gets ever closer. As he has done in each of his previous books, Christian Robinson captures the essence of the text, using colorful, often surprising collage artwork. 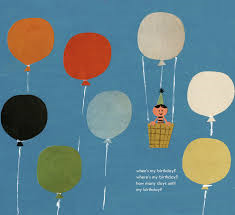 He fills the pages with all things birthday for little ones - balloons, cake, food, party hats, guests, gifts, candles and joy. Breathless and wondrous, spirited and energetic, it is the ideal birthday gift! oldest and busiest in town. Where might Pepper find the perfect dress? She needs it for a very special occasion. Her mother suggests Mr. Taylor's shop. Her family loves Mr.Taylor's work, as do many others in town. It is Pepper's first visit. She is warmly welcomed by the very kind tailor. And, she learns a lot from this very special teacher. He makes suggestion after suggestion for patterns that might appeal, all the while explaining the origin of each one. "What pattern is your suit?" TOO LOUD! 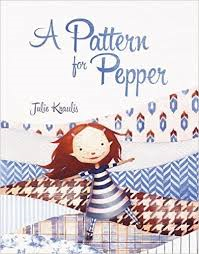 No thank you,"
As we read on, we learn the origins of a variety of patterns from around the world. All are described clearly as they wander through Mr. Taylor's inventory. Pepper politely, and with a sure voice, rejects many of the suggestions for personal reasons. Mr. Taylor is ever patient and always hopeful that the two will find exactly what Pepper wants for her special dress. When a decision is made, the two get to work to design, pin and cut the pieces needed to put it together. Once sewn, it's time to try it on. Only then does the audience see what has so attracted the little girl. When her special day arrives, she is proud to wear it for 'tea and croquet' with her grandmother. Julie Kraulis fills the book's pages with gorgeous artwork done in oils and graphite on board. The textures and design are remarkable. I love that the fabrics provide background for the storytelling and for our learning. The more I pore over the pages, the more impressed I am with the concept for the book and the artist's ability to bring this charming story so successfully to her readers. This lively, often humorous story is a gem! I know you've been there. You start the day with joy in your heart, go about your day - then, BAM! Something or someone can turn your mood around, and send you into a tailspin. You will also know, having been there, that your response to whatever offends you can turn the tide for everyone else you meet that day. 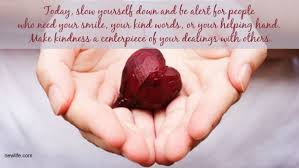 Your mood can affect others, and the rest of your own day. Bah, humbug! 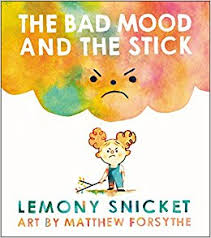 When the stick on the ground and Curly with the bad mood meet, things begin to go from bad to worse. Curly is mad that her mother did not stop for ice cream. The stick is innocently lying there, having fallen from its parent tree before Curly walks past. Curly likes the look of it, and picks it up. It is what she does with it that begins a chain reaction, punctuated by grumpiness for others. Too soon, her mother is carrying the bad mood and a very crabby countenance. The stick, totally innocent, is picked up from the bushes by a raccoon. Using it, the raccoon scares Lou into falling into a mud puddle. That makes Curly's mom laugh - bad mood gone! Lou is the recipient. Covered in mud, and needing to be clean, he heads to the dry cleaner's and Mrs. Durham. "Take that pencil outta your ear," said Lou. my underwear until you're done." Lou is not going to be put off. There he stands. You might think that Lou is quick to pass his bad mood to Mrs. Durham. You would be wrong! I wonder what happens to it? And what about the stick? The twists and turns are not expected, and the humor and charm are sure to delight. Matthew Forsythe's artwork is done with gouache, colored ink and pencil. He uses a bright palette, lots of expression, and significant detail to enhance the telling and make it even funnier. I promise ... you are going to love the surprise ending! down the street ... "
For those who read, there are words everywhere! It might be a road sign, a McDonald's arch, a grocery or errand list, the words on a cereal box at the breakfast table. Children and adults who are programmed for reading will find something at every turn. Think of your day, when and what you read as you went about it. It might surprise you to see how much time you spent reading. While reading plays a role in our days, how often do we choose a book to read? That is absolutely the best place to find what is truly worthy of capturing attention and providing a very special experience. In her new book of poetry, Amy Ludwig VanDerwater extols the pleasures of reading wherever you find words, and the places that reading will take yo. I'm checking on my team. if I'm a true fan. I wake up and read. 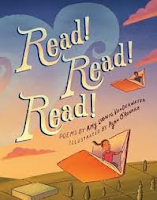 A celebration of the variety found in the things we read, children will find poems here that speak to them, that can be read together or alone, and that celebrate the joy to be found between the pages of a book. Kids who read and share these poems will know the magic of finding what to read at just the right time. They might even find themselves within the book's pages. I have lived in twenty countries. I have walked in King Tut's tomb. as I sat here in this room. I have stood upon a moonscape. I have witnessed peace and war. I have ridden a wild horse. "This is my chance! thought Smoot. He packed a few things - some shade, some moonlight, a change of underpants - and hit the road. Other shadows watched Smoot. The sight made them brave. "If he can follow his dreams, we can too." First, a dandelion's shadow flew away." Smoot's life hasn't changed much in the seven plus years he has been attached to his boy. While the boy lives a measured life, Smoot longs for action. But, they are attached and life goes on. Luckily, a shadow can dream. In his dreams, Smoot abandons the drab landscape that is his and dreams of all things colorful. These dreams augur well for him when Smoot and his boy lose their attachment by unknown means. Finally, he has the freedom to be what he wants to be, and do what he longs to do. 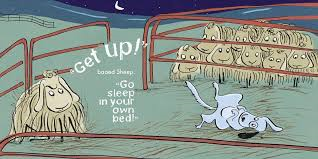 Watching Smoot enjoy life in wondrous wordless spreads will have young readers wanting to join in the fun. Observant children will see that his boy is also watching. Smoot skips rope while others go about their day in the park. Then, he moves on to ride a carousel, climb a tree, and race through a flower-filled landscape. Other shadows are out there, watching closely as he cavorts from one activity to the next. They, too, want to follow their own dreams. A dandelion shadow breaks away. The people on the ground make guesses as to what they are seeing. "It's a baby storm cloud." "It's smoke from a dollhouse chimney." "It's a butterfly made of mist." With each turn of the page, more shadows seek their freedom and do what they have been longing to do. 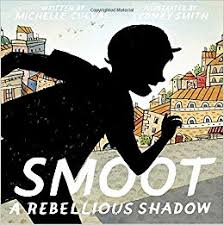 Smoot sees what is happening, and worries that the shadows could become wild and dangerous. He hatches a plan to find a suitable place for those shadows already free. Satisfied that they have lived their dreams, the shadows decide return to their original state. What about Smoot? You will have to find the book, then check to see for yourself. The plotline is so unique and engaging. Kids will watch in wonder as the story progresses. Sydney Smith creates his images in 'ink, brush, and watercolor, with a bit of Conte'. The contrast between black and color is effective in establishing mood. Smoot's outside-the-lines existence is full of joy, and enlightening for his boy. causes their lines to ... "
When two young boys draw lines on the ground where each is playing there is no telling what might happen. 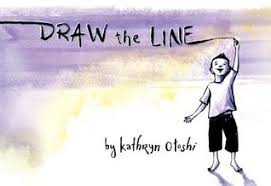 Kathryn Otoshi has an idea. In this wordless book she provides a setting for her 'readers' to discover one scenario that might come to pass. They are having such fun, without realizing that the other is there. When they bump butts, both wear a look of uneasy astonishment, and then surprise. It takes no time at all to see the joy to be found in linking their lines. One runs off, line in hand. Elated until he comes to a full stop; the line is coiled around the other. One is pleased, the other not so. That is how the misunderstanding begins. A stormy tug-of-war results in the contested lines creating a chasm between the two. Both angrily blame the other, widening the gap between them. There appears to be no common ground. As one walks away, the other lags behind. The first finds a place where the lines are no so far apart, and fashions a bridge with his fingers, from one side to the other. A smile erupts as the second boy approaches. Can they erase the gap that lies between them? I love the full page spreads, the use of color, line and emotion. Using the gutter to stunning effect, the book's design is impressive. That it is done wordlessly while communicating so much is testament to Ms. Otoshi's talent. Kids, when left to their own devices, can resolve conflict in wondrous ways! Do you remember having staring contests? Didn't take much organizing, or equipment. But you did have to have some stamina. I'm afraid I was not very good at it ... not competitive enough, I would guess. Also, it took up time that I could use for reading. The little girl in this book is really into it. Before the title page, we surmise her to be determined and adventurous. When she issues her invitation, she is sitting cross-legged on grass, with boulders in the background - those same boulders that provided her path to this space and time. A bird interrupts, but does not deter her from the contest. She explains she is having a contest with an unknown reader. Me? The bird wants to be part of the fun, and is issued the titular warning: DON'T BLINK! Astute watchers will see a turtle's head emerging at the edge of the recto. Turn the page for the fox's entry on the verso. The girl? She's still staring. The animals just keep coming, and all are welcome to join. A winner is not proclaimed. The lot wanders off to other ventures, leaving the turtle to finally make his way to the little girl. The game can begin once more! Lots of voices make this a perfect book for performance. Kids would have a grand time interpreting the various animals and showing the audience just how tiring staring can be. It might even be a new game for your repertoire. Cannot wait to share it with Sicily. She will love it! Full of expression, with an inspired design, it is a book to be savored, and read again and again. You definitely want to be part of the fun! "It wasn't easy. As the New York Sun reported, the moment the Carlisle men jogged onto the field, "the crowd at once began to indulge in war whoops." The Indian players didn't respond. They'd already learned to expect this obnoxious sort of reception. Yale came out in dark blue, with big white Ys on the fronts of their jerseys. The Yale players averaged about six feet ... "
What am I doing reading a book about football, I asked myself. It is written by Steve Sheinkin I told myself. You LOVE his books! I was right! I do love this book, and I found myself in awe of the story he tells about the great Jim Thorpe. It is a book about much more than football. As I found in the other books by this remarkable writer, it reads like an adventure novel while also imparting a historical perspective. 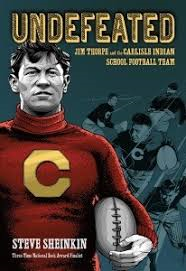 It taught me a lot about some very powerful stuff concerning the Carlisle Indian Industrial School, Coach 'Pop' Warner, football, and especially Jim Thorpe: his life, his family, his struggles and triumphs, and his legacy. Written in two sections, the first half discusses discrimination, both political and social, as it affected Jim Thorpe and others who attended the Carlisle School. Readers learn much about the Indian Removal Act, the two main characters, 'Pop' Warner and Jim Thorpe, and what their lives were like prior to 1907 when Jim became a member of the football team coached by Pop. The second half follows the football team and football itself: its beginnings, the many changes happening as football evolved in the early 20th century, and the part played by Carlisle School team members, their coach and the school's administration. Through play-by-play action I learned a great deal about the game, the racist treatment, the dangers, and the heart of those men who played alongside Jim Thorpe. So many differences in the game were, and have been, implemented since their legendary seasons between 1907 and 1912. Mr. Sheinkin includes Jim Thorpe's performance at the 1912 Olympics, when he won both the pentathlon and decathlon, and the scandal that followed it. Remember - he had never trained for either event. Familiar people, Theodore Roosevelt, Dwight Eisenhower and Geronimo, are also included as they had a part to play in his story. As he did in Bomb and Most Dangerous, Mr. Sheinkin leaves enthralled readers hanging at various points in his story, assuring they will want to keep reading. He asks us to think seriously about some of the issues that underscore his story, and wants us to question some common practices, even today. Is Jim Thorpe the greatest athlete of all time, as he can been repeatedly called? It's up to you to decide for yourself after reading his unforgettable story. Steve Sheinkin has found another unexpected story to tell, done sweeping and thorough research, and then penning an inspiring story to inform and reward. Ambitious and well-told, this perfectly epitomizes why we call it history. There are extensive source notes, a list of works used, archival photographs, and an index. A table of contents is useful as well.